Littman + White Galleries are pleased to announce a pair of exhibitions for the North Portland art collective and home gallery, Cat Castle. White Gallery hosts "That Femmiliar Feeling", a collection of curated Cat Castle works meant to exhibit the artists’ individual styles and works, simultaneously calling attention to emerging parallels revealed in a gallery space akin to the traditional “white box.” Simultaneously, Cat Castle will exhibit additional works from the same collection, calling attention to how the viewing of art changes in relation to the space where it exhibits. The White Gallery’s opening reception is on Friday, April 13, 6–9 PM, where all artists will be present to discuss their works. The Cat Castle reception in North Portland will feature art, live music and karaoke, and runs Friday, April 13, 8:00–11:59 PM Light refreshments will be provided at both; Portland State University is a dry campus, Cat Castle in North Portland is BYOB. connections and collaborations, that familiar feeling, that will create our own world within the art world. 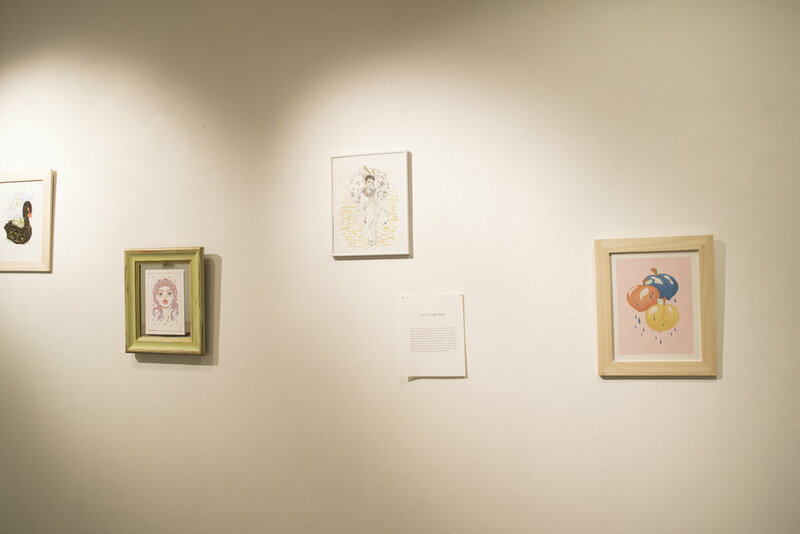 Slightly lowbrow, and always independently hosted, Cat Castle Collective is a monthly space to exhibit new works from local artists such as the works shown in this series. We invite you to peer closer and see the lines that intersect and make this union unique. Cat Castle Collective is the artists Merry Jo Carter, J Simpson, Lily H. Valentine, Amy Woelbeast and Indigo Wren. bodies? J Simpson hopes to inspire others to look for the liminal, to promote real understanding and empathy. He is a musician/artist/DJ/writer and critic, living and working in Portland, OR. Always striving to turn the unturned stone and uncover hidden themes, Lily H. Valentine, aka H./Pink Gorgon, uses fine lines of ink, gouache and an odd juxtaposition of colors to create allegorical and dreamlike illustrations. Inspired by the feminine form, animal familiars, and subtle mutations, H. explores the possibilities that relate the surreal to the set-in-stone. The works shown in this series showcase the growth over a short amount of time and the hope for many new adventures ahead. The form it may bind us but the world is wide and we are endless. The elusive Woelbeast uses a series of primitive and yet oddly charming clicks and grunts to communicate what her work means. Unfortunately, translation proves difficult at best, and the Woelbeast’s long, uninterrupted hibernation periods makes getting information out of them nearly impossible. Suffice it to say, their work is primarily based on animal dreams, prophetic tidings passed down by the old gods, and other assorted gobbledegook. a sequence of real or imaginary images like those seen in a dream. These paintings showcase an attempt to relinquish control as an artist. By creating something full of "happy accidents" and cell patterns that are reminiscent of magnified cells, I find comfort and balance. Indigo Wren’s canvasses are a molecular kaleidoscope of vibrant colours and intricate textures. Indigo’s art speaks to an organic technology, where circuitry is indistinguishable from a cell sample; where nature’s hidden language whispers its secrets in colours, shapes, and textures. Sign up to receive news and updates about upcoming exhibitions and events. Littman + White Galleries is located in the heart of downtown Portland, Oregon in Multnomah County. We at Littman + White honor the Indigenous people whose traditional and ancestral homelands on which we are located––the Multnomah, Kathlamet, Clackamas, Tumwater, Watlala bands of the Chinook, the Tualatin Kalapuya, and many other indigenous nations of the Columbia River. It is important to acknowledge the ancestors of this place and to recognize that we are here because of the sacrifices forced upon them. In remembering these communities, Littman + White honors their legacy, their lives, and their descendants.